I have done one of her small panels and found it really easy. I would go with a kit because her fabric choices are great and I would hate to try and find all the right fabrics, also she uses so many different fabrics, if you had to buy a FQ of all of them it would probably cost you more. I would use something like MonoPoly by Superior Threads to stitch the applique down, as it would be easier than changing your threads all the time. 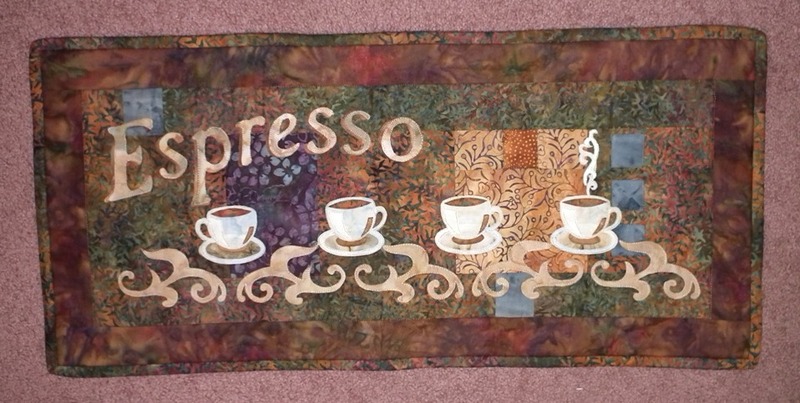 This is the one I made, I had only been quilting for around 2 years when I did it. I've done a few of her patterns, and I do enjoy them. They do have lots of tiny pieces, and are time/labor heavy. But SO worth the results!! Her patterns are pretty detailed so I think you would be fine - going with a kit is a good thing in my opinion - her fabric choices are what makes her quilts work! I've done lots of her patterns over the years- I love her designs. she makes them fairly easy to understand. 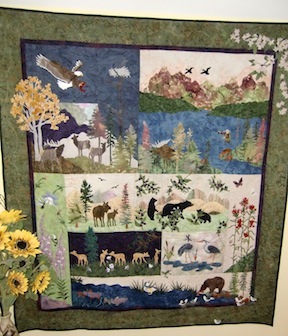 that last baby quilt I did was one of hers- I've done lots of her outdoorsy fish, bears, I've never seen one not turn out beautiful. 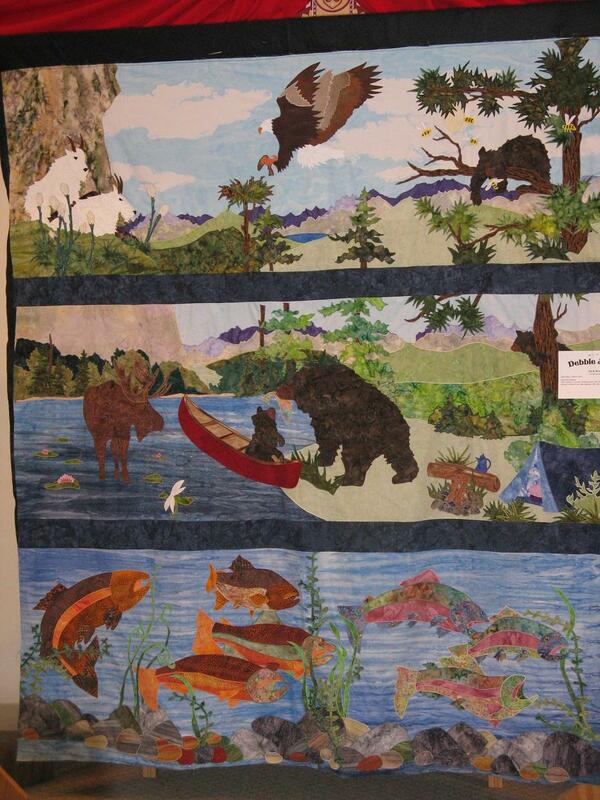 here's the McKenna Ryan 'Giraffic Park' quilt. I'm glad to see this thread....I signed up for the Wind in the Whiskers BOM and haven't started yet. I've received 3 blocks so far...I think I need someone to come visit and work on this with me!!! Forgot to mention I am getting the full kit for each block so I know it'll all look good in the end...I'm just terrified to start. I was just at her showroom on Friday at Bainbridge Island, WA. She is closing it in a few months.and is in the process of moving to Portland. The person in the store was not sure if she would re open there. Everything will still be available on line. It was great to see her original work. I did buy patterns, but not much material, as I have so many batiks that would work. I just could not justify the kit when I have so much on hand. so glad to see this thread too. I really like her patterns but couldn't figure out how it would work. This is the one I want to make. Too bad we can't work together. I am doing her Heaven and Nature Sing as a BOM and the pieces are fusible backed & laser cut. There is little tags left to cut holding the piece in the fabric. I am working on her older owl patterns, they take time but are not what I call hard . A mini iron and an applique pressing sheet is a must for me . I do not care for pastels so I am using my own color choices in batiks and I am happy with the results. I did "At Home in the Woods". Love, love, love it! If I can do this, I know anyone can. Good directions and great fabric. How do you machine stitch around all those tiny pieces. This is a great question. FMQ around each piece BEFORE you put the blocks together. I say this because I DID NOT do this and wish I had. I did the stitching before I put the two large pieces together. I also used monofilament thread. All of these pieces had to be stitched down before my longarm lady would quilt the quilt. My quilt is hanging over the stairs at the landing out of the direct sun light. I've never heard of her and I know why. I would probably never look at anything of hers because of the size of the pieces. But, gosh, you guys have shown me the way. These are beautiful, whimsical and just too cute. Now I'll have to check her out. Love your quilt. I have yet to use any of McKenna Ryan patterns or kits, but some day I hope to. Come visit and we can finish the one I started his spring!! 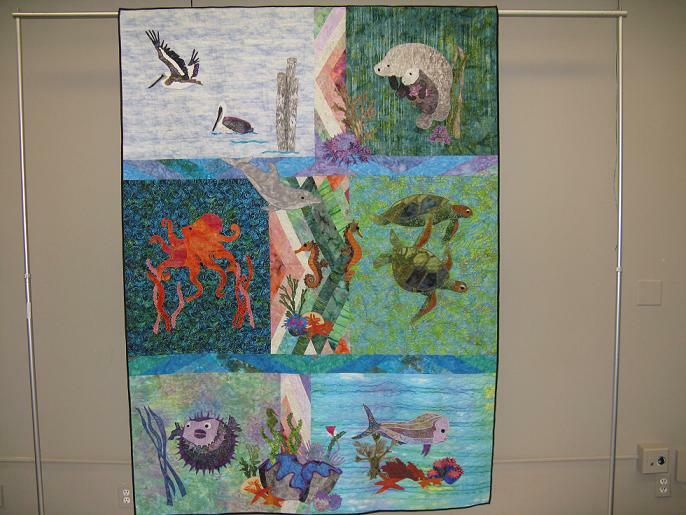 littlebitofheaven-I love your McKenna Ryan quilt that you made You did an awesome job! 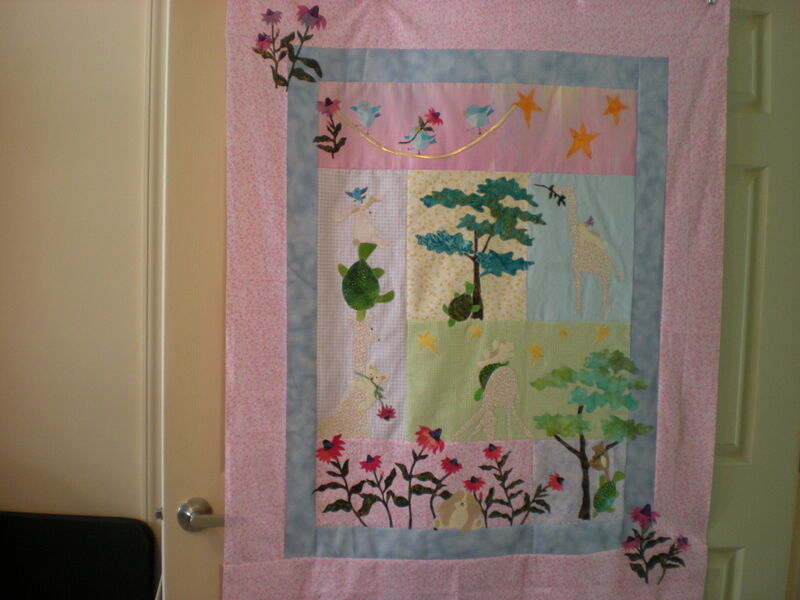 I have made a lot of her quilts, some as bed quilts. My solution was to enlarge the patterns and then satin stich them down. They then go through the washer and dryer. Use a piece of parchment paper instead of the expensive sheet, it5 works just as well. I have taught some classes where the students use the patterns as provided with extra webbing, fuse to the background then stretch over artists' canvas and staple down ready to hang. They were a big success. If you enlarge them and use some of the simpler ones it is doable.